Let Shue Brothers’ experienced staff and varied fleet of equipment help you with your next project. 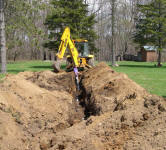 Whether you need a new septic system, are building a road, excavating a new homestead or building, clearing land, or laying pipe, Shue Brothers can help. A sampling of our equipment includes, bulldozers, backhoes, trackhoes, skidders, graders, tractors, lawn seeders, tractor with a boom mower, payloaders, and skidsteers. Shue Brothers can also build steel and wooden deck bridges set on concrete blocks to traverse streams, creeks, rivers and ravines. 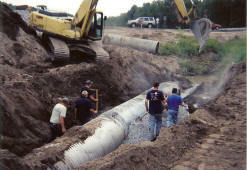 Not only do we have the right equipment to get your job done quickly, but we have the experience to do it correctly. When considering building roadways or driveways, experience counts. Be sure to ask your excavator if they have done a job similar to yours in the past and listen to their suggestions. Also ask for references or photos. It is much easier to do the job correctly the first time.